Quantum Mutual Fund is India’s first dedicated, direct-to-investor mutual fund. Quantum Mutual Fund offers simple and easy-to-understand products. Investing for the long term is not complicated. Any computer engineer, doctor, or scientist can be a good investor. But it is practically impossible for a mutual fund manager with a business, commerce, or economics degree to be a computer engineer, doctor, or scientist. Yet the mutual fund industry is built around structures that encourage fancy products; layers of expensive costs; and reams of verbal garbage. All these complicated and opaque structures add to your costs as an investor. And any extra cost that is additional comes mostly from your money, from your returns. Setting up a mutual fund to invest in India was an idea that Ajit Dayal - the founder of Quantum - had when he was studying in USA in 1983. Not being smart enough to be a doctor or a scientist, Ajit was keen to pursue a career in the field of investments. And Ajit had a strong desire to “come back home” to India and “do something to change India”. His stay in the US exposed him to the world of mutual funds. Though India had the Unit Trust of India - then a government monopoly, which was a mutual fund - it was sold more like an investment in a fixed deposit. Investors were promised a dividend by the agents. No one knew what the true value of the underlying portfolio of UTI’s Unit Scheme 1962 was. Ajit decided to get into the financial services business – a business where there was no corruption and which would be a clean business. But converting the dream to a reality took over 25 years. While waiting to qualify for a mutual fund license to launch mutual funds, Ajit continued to gain knowledge and experience (and, yes, the common sense!) under the umbrella of Quantum Advisors. Quantum Advisors is the Sponsor and parent company of Quantum Asset Management Company and the Quantum Mutual Fund. From 1992 to 1995, Ajit and Quantum were the local partners of Jardine Fleming in India, then one of the largest FIIs in India. Between 1996 and 2004, Ajit and Quantum managed money for various FIIs. Ajit was also the Deputy Chief Investment Officer of Hansberger Global Investors, Inc (a US-based company with over USD 5 billion of assets under management - with more money invested in stock markets worldwide than what UTI had invested in Indian stock markets). Ajit was the lead manager of the USD 2 billion Vanguard International Value Fund. Managing large pools of money gave Ajit tremendous confidence and added to his experience. And over the years, Ajit has built a team that has allowed Quantum to adopt a very process-driven investment thesis. Building a team-driven process - as we have in Quantum Mutual Fund - is another positive for the investor. Many funds adopt the “star fund manager” approach. A specific fund manager is promoted in the media and quickly establishes the mantle of a “star”. Being a “star”, the fund manager begins to make unilateral decisions - like the head of the communist party, he is first amongst equals. Nothing gets done without a specific “go ahead” from the “star fund manager”. All this is fine - but what happens if the star fund manager leaves his job and joins someone else? The investor is told not to worry, because the fund house is so large, they will replace the departed “star”. But what if the new fund manager, does not like the stocks that the old “star” had? This new star will then sell the “old” stocks” and buy “new” stocks - the ones that the new star likes. Every time a share is bought or sold - "portfolio turnover" in our financial jargon - it adds to costs. Someone has to pay the brokerage, commission each time a stock is bought or sold. That “someone” is you - your investment in the mutual fund. And what if this new “star” was to leave again in three years? You get the picture...stars come and go but your costs will stay forever. Now you know why having an “investment philosophy” is so important. Because when you build a team, you need to have people in that team who are believers into a particular philosophy. Then, even if people from a team leave (and they can and do) the stocks owned in the portfolio do not change. Because the team chose them. A research process that Quantum Advisors has adopted over the decades. Not based on tips and suggestions and market khabbar, but on analysis. Yes, we do get updates from brokers and their team of analysts. But we don’t buy or sell stocks based on what the brokers tell us to do. We need to be convinced of the idea. With our own conviction, comes action. The action to buy; to sell; or to do nothing. All supported by a well defined research and investment process. Which means the stocks we own in the portfolio have predictable characteristics. And a predictable behavioural pattern - as seen in the Quantum Long Term Equity Value Fund. When markets fall, we will most likely fall less. When markets rise, we will most likely rise less rapidly. But, over a cycle, we will make you money - and make sure you have not lost much sleep over the ups and downs of stock markets. Now that we have shown you how we manage your money lets get back to how do we let you know we exist, how you can invest with us? After getting the license, Ajit went to meet various well-known distributors to see how they could help in the marketing of the Quantum Mutual Fund and raise money for the Quantum Mutual Fund. To Ajit’s shock, the distributors had little interest in Ajit’s track record or the track record of the Sponsor, Quantum Advisors. They had only one question: how much will you pay me? Based on what you are willing to pay me, they said, this is what we can collect for you. And we cannot guarantee that the assets we raise for you will stay with you for more than 6 months. 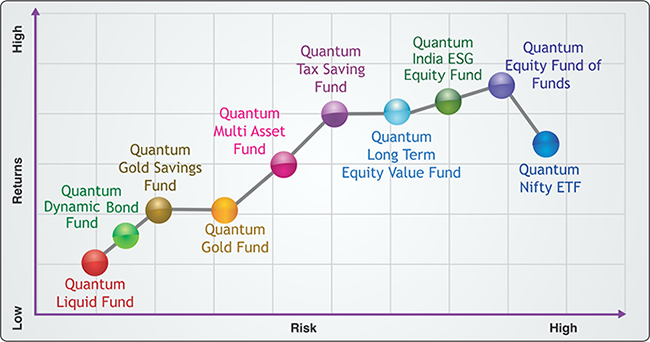 My commission The money I collect for Quantum Mutual Fund will be Is this fund good for my investor? The mutual fund industry was created to help investors invest for the long term. The investors are supposed to select funds that match their risk-return profile to achieve their long term investment goals. the predictability of the performance. All the distributors wanted to know was: mere liye kitna paisa hai? This cannot be right, said Ajit, the industry must change. The needs of the investor must be paramount. We think the gentleman was being polite to us: we are not even an ant. We are a speck of dust. But we may be a viral threat. *The Quantum Long Term Equity Fund has been renamed to the Quantum Long Term Equity Value Fund w.e.f 18 April 2018. **The Quantum Index Fund ETF has been renamed to the Quantum NIFTY ETF w.e.f 24 May 2017. Ajit Dayal ko gussa kyon ata hai? So, here we are, the 29th mutual fund house in India and one of the smallest. We are known as the angry boys of the industry. Many distributors write to us puzzled why we “spit venom” and are “angry” at them. And focus on keeping costs as low as we can. No, we are not angry. We are delighted and honoured to be the 29th mutual fund house in the country but the first to work against a distribution system that is loaded against the investors. And the first to focus on simple products and stay away from launching complicated products that clutter your portfolio. We have chosen a path that no one else has chosen. A path not chosen by the large giants whose brand names you see everywhere on billboards and neon signs. A path not chosen by the foreign companies who have set up shop in India and launched mutual funds here. A path which allows us to sleep well every night. Knowing we are doing the right thing. Our proposition is that simple, really. why the Quantum Liquid Fund did not tarnish its name, track record, and liquidity at a time when some of the largest fund houses in the country were in trouble because these funds held illiquid assets. We love what we do…and we could go on and on….ask us any question..and we will respond to it.